Like many of its competitors, Irvine, Calif.-based Cylance developed a product that provides organizations with endpoint security. But Cylance’s Protect takes a different approach, using algorithms, artificial intelligence and machine learning to proactively predict the behavior of a file—thus stopping ‘bad files’ before they can do damage. Cylance’s mission is big, "to protect every endpoint on the planet," according to Chief Marketing Officer Greg Fitzgerald. The current foundation of endpoint security today, based on signatures and certificates, is "fundamentally broken," he adds, because the bad guys "know how to get around that baseline of security." Cylance’s architectural design is focused on understanding the "DNA" of files. "We extract the features of a file and apply mathematical values to those features, and from that, we create algorithms that analyze the features to discern whether they cluster towards good or bad," says Fitzgerald. Cylance employs 10 mathematical PhDs, while most other companies that have tried an AI approach to security have hired only one PhD. "We’ve been able to understand the process and science behind applying a static analysis to a dynamic environment and to achieve unprecedented accuracy rates in determining the predictive behavior of what a file will be," Fitzgerald explains. He adds that the AI approach gives Cylance’s endpoint security an accuracy rate of .0002 percent, compared to an industry average of 0.5 percent. 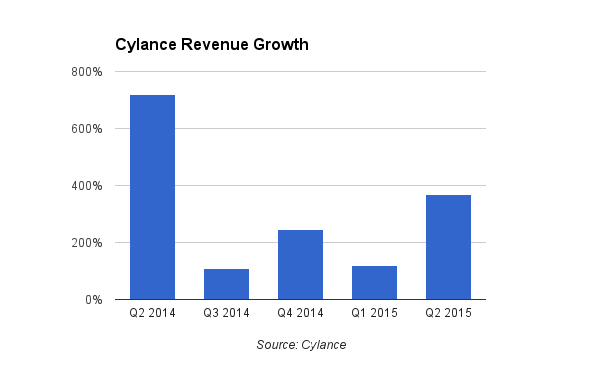 By taking a disruptive approach to endpoint security, Cylance is experiencing strong revenue growth, a 369 percent increase in Q2 2015. EWeek proclaimed that Cylance is delivering "the anti-malware product of the future." The company has won numerous awards, including "Best Emerging Technology" of 2015 from SC Magazine (both Europe as well as the U.S.) Cylance has about 300 customers, many of which are Fortune 500 firms in energy/oil and gas, healthcare, banking/financial services, and high tech. Cylance’s Vice President of Strategy Jon Miller was even featured in a late 2014 "60 Minutes" segment about the Sony hacking scandal. Former McAfee executives Stuart McClure (now Cylance’s CEO), author of "Hacking Exposed," and Ryan Permeh, Cylance’s Chief Scientist, founded Cylance in 2012. The company now has 130 employees and is expected to grow to 200 workers by year’s end, according to Fitzgerald. Cylance received $15 million in Series A funding in February 2013 followed by $20 million in February 2014 and $42 million on July 28, 2015. Fitzgerald points out that the firm is already profitable, and the latest funding round is "purely for investing in sales and marketing growth, not product development growth." The investment in sales and marketing is needed to help Cylance overcome what Fitzgerald says is its biggest challenge: a low brand-name awareness compared to entrenched firms such as Symantec and McAfee. Increased awareness will help Cylance become "one of the top three firms under consideration when companies go to change out their endpoint security," he said. Scaling quickly while maintaining quality customer support is another challenge, Fitzgerald says. He doesn’t see Cylance’s competitors as a challenge, however. When asked if a more-established firm could replicate Cylance’s success in applying AI and machine learning to endpoint security and thereby steal its thunder, Fitzgerald admits such a thing is possible -- but only to an extent. While one or more competitors might "delay" Cylance’s success, Fitzgerald says, "they won’t prevent us from winning."